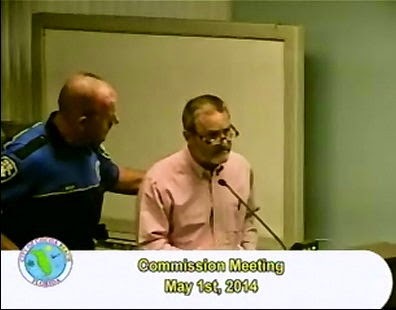 COCOA BEACH, Florida -- Cocoa Beach Mayor Dave Netterstrom took an aggressive approach to what he saw as disrespectful decorum by residents during a Cocoa Beach City Commission meeting on Thursday, May 1. The meeting began with public comments where some speakers voiced their disdain over the Cocoa Beach Art festival being moved to Port Canaveral. During her comments, Harriet Firsh started to say, "I warned Commissioner Tumulty about this. Not to mention that his name on a new board is not only a.."
That's when Netterstrom interjected and said, "Harriet. Be careful with your words. Because I'm not going to allow it." "Well, after listening to two months of two meetings of your....," Firsh replied. "Thank you, please sit down," Netterstrom interjected again as he struck his gavel. "...When people start getting negative emotionally, I'm not allowing it any more. This is a very respectful forum and I'm done with it." Former City Commissioner and longtime local political activist Tony Sasso then came to the podium out of turn in protest. "Mayor, you know I've sat in that seat. Nobody likes being criticized. But this is public comment," said Sasso. "Tony, please sit down," Netterstrom ordered. "No, I'm not sitting down," Sasso replied. "You throw me out. 'Cause I'm telling ya, I've got a right to speak. This is public comment. This is the United States. Free speech. Shame on you, Mayor. You're getting too full of yourself." As Sasso was escorted out of the Commission room by a Cocoa Beach Police Officer, his parting words were, "I want it on record that I was thrown out." The next public speaker was Angela Richards, who started her remarks by saying, "I'm afraid to talk because I think I'm going to say something negative." Former Cocoa Beach Mayor Janice Scott later came to the podium and pointed out that, while she was Mayor, a 1st Amendment lawsuit related to public comments before the Commission was filed against her and the City of Cocoa Beach that went on "for 3 to 4 years," took seven attorneys, "and almost a million dollars" to defend. "I really do think that there should be some severe counseling about free speech," Scott said. "Now if somebody wants to make an ad hominem attack, they have the right to do that. It's unseemly for Commissioners and elected officials to do that on each other sitting at the diocese." We have a very liberal policy for public speaking in Cocoa Beach (far greater than required by Florida Law). We allow public speaking at every agenda item and allow general public speaking at the beginning of the meeting about anything as long as it relates to something appropriate about the city. Sometimes, public speakers can get nasty, harsh, personal or even hurtful and I have pledged to stop this. There are many different viewpoints, ideas and opinions and I want to make sure all are respected. As Cocoa Beach breaks some eggshells to make some positive changes and with the elections coming, public speaking will get tense and I want to set the stage for a respecting each other. "I'm not proud of how I handled the meeting last night. My apologies to the speakers and community and please accept that even a Mayor can have a bad day once in a while."